I first met Andi Cumbo-Floyd on line almost two years ago. I believe it might have been on Twitter. I started following her blog and eventually took her essay class, which is fantastic. Andi is a dear, kind, generous, gifted writer and teacher. I have learned so much from her over the past couple of years. She demonstrates incredible patience when I come at her with a million questions. She handles everything with grace and professionalism. I am happy she agreed to do this interview with me. I hope you enjoy it. You know, it wasn’t until graduate school that I really wanted to be “a writer” per se. Ted Gup, one of my professors, told me that I might want to think about getting an MFA instead of the PhD in literature that I was planning on. That was the first moment that I thought about how much I liked to write. I had always wanted to be a reader – you know, someone people would pay to read books – but a writer – someone who produced those books – that was a new idea to me. 2) Who have been your influences? What a good question – so first, my parents. They were profoundly generous people, and they taught me always to be kind, even when people weren’t kind to me. They were also big readers, so I got that true from them. My mom could read three or four books in a week, and my dad probably averages about 2 himself. In terms of writing, I would say Madeleine L’Engle and C.S. Lewis were the first writers who pulled me into new worlds. I still love them. Also, Tracy Kidder, Toni Morrison, Sherman Alexie, Chaim Potok, Lia Purpura . . . I could go on forever. 3) What books help shape you as a writer? Well, A Wrinkle in Time by L’Engle and The Chronicles of Narnia by C.S. Lewis taught me that words have real power – the power to heal and comfort and shelter. I learned a lot about incorporating research in writing by reading House by Tracy Kidder. Brenda Miller’s Season of the Body helped me understand structure and the way point of view can alter the entire power and feel of a piece. Rebecca Skloot’s The Immortal Life of Henrietta Lacks showed me a braided structure that is both about the subject and the writer herself. One Hundred Years of Solitude by Gabriel Garcia Marquez gave me permission to use the fantastical – the huge imaginary – in my work. And so many more. 4) What is your favorite genre to read or write? What inspires you? I absolutely adore the essay – the personal essay, the memoir essay, the meandering essay, the avant garde essay – any essay, even academic ones sometimes. I love to read them and write them. They just remind me how versatile both language and the human experience are. LOVE! When I’m just zoning out though, I usually choose young adult novels with some sort of supernatural bent. Magic always makes a day better. 5) In your book, God’s Whisper Manifesto you write about your dream about owning a farm, when did you initially get the vision? About ten years ago, I started hearing a lot of my friends – many of whom were doing work with disadvantaged populations or in developing countries – telling me how tired they were, how much they just needed a break, and I got this idea to have my home be a place where people could come and find respite. As I thought about that dream, I began to read a lot about local foods and sustainability – people like Barbara Kingsolver and Jenna Woginrich. And as I thought about these things, I began to develop a dream for a farm, where we grew our own food, supported local farmers, and also provided people – artists in particular – a place to come and rest. Hence, the dream – and now the reality – of God’s Whisper Farm. 6) Besides owning a beautiful farm, writing on your blog, you also have another book coming out, You Will Not Be Forgotten. How did the idea for writing this book come about? 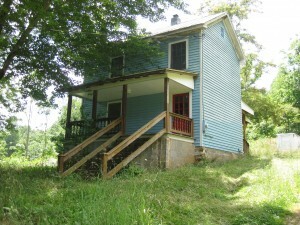 I grew up on what used to be a slave plantation here in Virginia – my dad was the manager there. All the time I lived there in high school, I never really thought about the people who built that place, the slaves. Sometime in college, I realized that some of the people I had gone to high school with were probably descended from those enslaved people, and I began thinking, wanting to know more about the individuals who had lived there and built the massive plantation houses on the property. So, that’s where the book began. 7) You also teach online classes, coach and edit manuscripts, besides crocheting the most adorable things. Could you tell me a little bit more about this? Well, I was a college professor for over ten years. I taught creative writing and composition and literature. But I decided to step out of that to focus more on my writing, but I still love to teach, and I love to work with writers of any experience level. So I started Andilit – my business of online classes and manuscript editing. I’ve been making living for over a year now just doing that, and it’s wonderful. 8) I read you have earned a Bachelor’s Degree and two Master’s degree. You were also a professor in many universities across the United States. Did you always want to be a professor? What was the pivotal moment you decided you wanted to be a writer full time? Yep, I’d always wanted to teach literature . . . right up until that day when Ted Gup suggested an alternative. Then, I refocused and moved toward wanting to teach writing, which is what I focused on for part of my MFA. But then, my mom got sick and died from cancer, and that put a lot of things in perspective for me. I didn’t want to spend my time in meetings or doing administrative tasks for colleges who did not appreciate my teaching or writing in any serious way. I wanted to write and work with other writers. Hence, my own business. 9) What does your average day look like and what is your writing process and routine? My day begins when my husband’s alarm clock goes off. He rolls over and snoozes; I get up and get the coffee on. I do some morning chores and have breakfast with him, and then I hit the computer. I try to blog early in the day and then spend some time connecting with folks on Facebook or Twitter or via email. Lately, I’ve been moving from that into my client’s work – editing manuscript, working with students, etc. Usually, I take some time in the mid-day to read a bit, and then I’m back editing or reading student work. Toward the end of the day, I turn to my own work and do my very best to get 1,000 words a day in every day.It used to be that I always wanted to get my own work in first, and there is something to be said for being free of other voices when you go to the page. But lately, I’ve found it very wonderful to look forward to my work-in-progress all day. Plus, I like to close my day with creativity. It’s a wonderful way to be tired. 10) Lastly, what advice would you give to an aspiring writer? Write. That’s it. Write and read. Don’t worry about figuring out your niche or building a platform. If you want to write – if you want to write for the art itself, I should say – then just write. Practice, practice, practice. There’s so much to life as an artist that can’t be measured with money or rankings. Focus on the art, and you will never be disappointed. 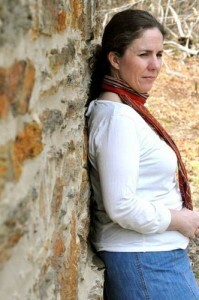 Andi Cumbo-Floyd is a writer, editor, and writing teacher who lives and works from her own little 10 acres in the mountains of Virginia – God’s Whisper Farm. She is happily married with a hound dog named Meander and three cats – Oscar, Emily, and Charlotte. With the help of her husband and dad, they are building a little place there for writers and artists to come and respite and sanctuary. She is a creative nonfiction writer who is in the stages if self-publishing her book entitled You Will Not Be Forgotten, which tells the story of the people who were enslaved on the plantation where I was raised and of my process of getting to know them. 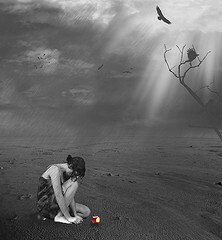 You can visit her blog at www.andilit.com. Lately people have been saying they don’t know how I do it all. How they wish they had the time to do something they love. I thought to myself… what is stopping them from doing what they love? What is getting in their way of pursuing something they are passionate about or enjoy? But then I remembered I was one of those people. A spectator standing on the sidelines watching others pursue what they enjoyed. Here’s the thing, no one was stopping me from pursuing what I enjoyed. Excuses were. God gives us twenty-four hours a day. What are we doing in and with those twenty-four hours? Is all the time going to work? Or are we wasting time on other things or activities that could be replaced by something we love doing instead? Are we managing or stewarding our time properly? Are we disciplined? You see my friends, what it all comes down to is choice. I choose to get up an hour and a half earlier to spend time with the Lord and do what I love. Is this easy? Absolutely not. It’s a sacrifice. But I made a choice. I decided getting up early and carving out time in my day to do what I love is important to me. I sat down one day and thought about how I could incorporate time to work toward something I love without it eating into my job, obligations or family time. I came up with a plan, that I would either get up an hour earlier or stay up an hour later consistently. 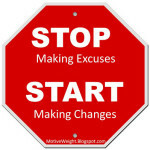 I was committed to taking a small portion of my time daily to work toward my goals or dreams. But I always make sure to spend alone time with God first before I do anything. This sets the tone for my day. Then I move into something I love, enjoy or am passionate about for the remainder of the time. Please understand that even committing a half an hour a day is better than nothing. You have to start somewhere and stick with it no matter what. I promise you, that if you do this consistently, you will see a difference and feel better too. Do you feel stuck or unfulfilled? What are some small changes can you make or steps you can take to change this? 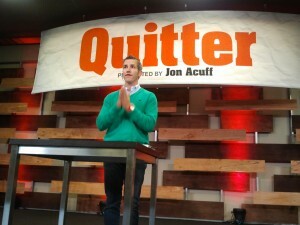 This is Jon Acuff. He was kind enough to pray for me while I was dying of laughter. I was laughing so hard they were going to have to carry me out on a stretcher. I kid you not. Anyone who can make me laugh and cry in one sentence is seriously gifted. I tried to hold back (as I was sitting in the front row) but to no avail. I couldn’t help myself. I do not remember laughing and crying so much in a long time. My stomach still hurts days later from attending the Quitter Conference. I believe the Lord wanted me at this conference. I had all the excuses in the book not to go, but yet and still, I felt the nudge of God telling me to go. The week leading up to the conference all hell broke loose. I can see why now, I was blessed beyond measure. I have to be honest and admit that initially I did not have high expectations. I was even wondering if I was wasting my time and money by going. Also, leaving my family behind was definitely not my comfort zone. My boys were not feeling my leaving them. As as matter of fact, my eldest son told me to never to do that again. He said next time I have to take him with me so he can make sure I am ok. I guess next time we’ll have to make it a family vacation. 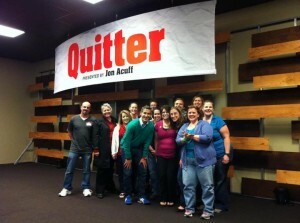 Initially, I thought the Quitter Conference was just a lot of hype. But I was so wrong. This conference was unlike any other conference I have been to in my entire life. I am not exaggerating. I can see why everyone makes a big deal about Jon Acuff. He is such an authentic, down to earth and great guy. I had the pleasure of meeting and speaking with him a couple of times at the conference. Let’s just say this conference made me believe in my dreams again. Hello world, my name is Pilar and I am a reborn dreamer. Besides hearing Jon Acuff, I also got to hear wonderful speakers such as Al Andrews, Matt Chambers, Jeff Goins and Alli Worthington. What an amazing line up. Last but not least, the absolute treat of this conference was listening to Jon Acuff’s favorite band, Seryn. They are now my favorite band. I want everyone to know about Seryn because I had a spiritual experience listening to them. I have never felt so much joy listening to a band in my life. I have been a lover of music my entire life. I am also a singer, so I have been exposed and my ear trained to know good music. This band is simply amazing. You must see them live to get the full effect. Each band member knows how to play several instruments extremely well. 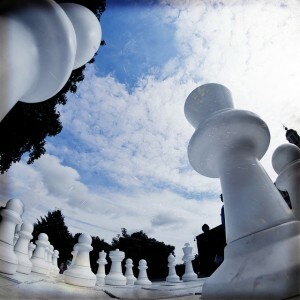 They are virtuosos. Seryn’s lead singer Trenton Wheeler (isn’t that a cool name), absolutely poured himself out. He is an exceptionally talented artist. His voice is unique, his sense of rhythm impeccable and his gift of playing several instruments is out of this world. I guarantee you if you see them play live, you will be mesmerized and left in a trance. Since hearing them, all I’ve been doing is talking about them. I am hoping they will come play in New York City. 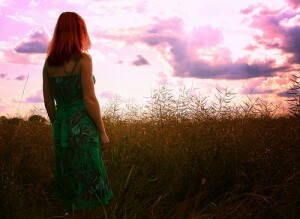 Thanks to my dear Quitter friends, Jon Acuff and the Quitter Conference, I am a reborn dreamer. I have renewed hope to pursue my passions and dreams. I was able to reconnect with my deep love of music and singing by going to this conference. I am not too old and I haven’t missed the boat either. I am right where God wants me. So I am no longer dreading turning 46 in two weeks. If there is one thing I took away from this conference is our dreams are not ours, but for others. I was deeply moved and inspired by this concept and it helped change my view of dreams. In conclusion, I want to share a link of one of my favorite songs by Seryn. If you like their music, I encourage you to buy their latest CD on ITunes. You won’t be disappointed.